Silver, a natural occurring precious metal, has been used for many years as currency, tableware, cutlery, jewelry, and more. In jewelry stores, however, we often see terms like “fine silver,” “sterling silver,” or “925 silver.” Are they the same as plain silver? This article will specifically discuss the difference between sterling silver and just plain silver. Silver, also called “pure silver,” or “fine silver,” contains 99.9% silver and a diminutive amount of other elements like copper. Without other metals, silver is very soft, making it almost impossible to shape. Fine silver can be identified through the following labels: “999,” “99.9” or “.999.” Like gold, it is not prone to tarnishing. It cannot be easily damaged by exposure to water and air, but it loses its stability when exposed to sulphuric acid. Since it is very pure, fine silver is too soft and vulnerable to be used in cutlery, jewelry and tableware. However, the element silver is present in electronics, glass coatings, medicine, and coins. Intricate designs are possible with sterling silver because of the hardness contributed by the other metals in the alloy. Aside from being used for surgical equipment, flatware, accents, cutlery, and jewelry, it is also used for musical instruments like flutes and saxophones for its resonant timbre. Sterling silver has a low overall value because of its low purity which is why jewelry items made from sterling silver are typically affordable. However, since it contains other metals, sterling silver may react with oxygen and other elements, making it susceptible to tarnishing. What, then, is the difference between silver and sterling silver? 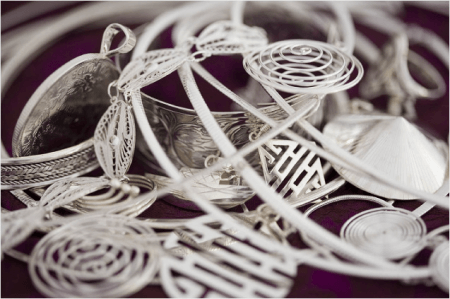 Sterling silver contains 7.5% other metals so it is more ductile than fine silver. Fine silver is too soft and susceptible to dents if used in tableware, cutlery, and even jewelry. The hardness of the other metals present in sterling silver also makes it possible for jewelry designers to create intricate details. Additionally, sterling silver is susceptible to tarnishing because of its copper and nickel content. Pure silver can withstand exposure to air and water but not to sulphuric acid.